Herb Cox is the lead singer of the Cleftones, a doo wop group that had hits in two periods. The first was 1956 when they had three hits with songs composed by group members, including “Little Girl of Mine.” The second was in 1961 and ‘62, when they had three more hits with remakes of old pop songs, including their biggest : “Heart and Soul,” to this day one of the most popular pieces for beginning pianists. It was written as a rare collaboration by two top songwriters. The lyrics were by Frank Loesser, who wrote many Broadway musicals, and the music was by Hoagy Carmichael, who also composed the immortal “Star Dust” and “Georgia.” In 1938, in the big band era, “Heart and Soul” was a hit for Larry Clinton, who introduced the song in a film short called A Song Is Born, and it was successfully covered by two other acts : pianist Eddy Duchin and bandleader Al Donahue. It was revived in 1952 by the Four Aces. The song was a natural for a doo wop treatment, as its verses use the “Blue Moon” progression : here as I VIm / IIm V. The Cleftones simplified the bridge. 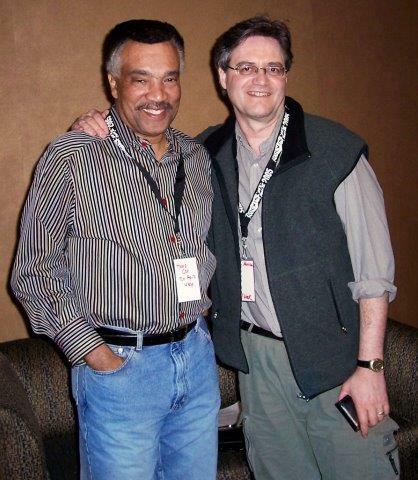 I interviewed Herb Cox at Rockin’ Fest II at Green Bay, Wisconsin, April 2005. Most of my questions have been edited out. 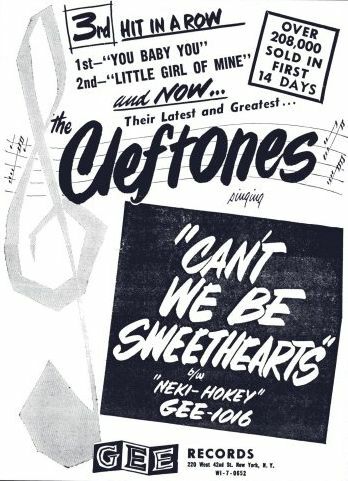 The source of the picture of the Cleftones on stage, as well as the ad at the bottom of this page, is Marv Goldberg’s R&B Notebooks - here, used by permission. Herb Cox : The Cleftones got together because we went to school together. We were five young men in a high school in Jamaica, Long Island [New York] but the common thread with the group is that each one of us had some musical aspirations even before we met one another. We came from fairly diverse roots. I came from Ohio. I was born on May 6, 1938 in Cincinnati. I spent most of my early childhood there. My family migrated to New York and I became a permanent resident in New York at the age 11 or so. My grandmother was very active in the gospel church and she wrote songs of her own, primarily gospel songs. She played guitar and we used to sit on her front porch and sing songs like “This Little Light of Mine.” I wrote a song when I was eight years old and she sent off and got it published. I was amazed. She encouraged me in that way. The early gospel influences were one of the things that attracted me to music. My mom was a would-be blues and jazz singer. She idolized Billie Holiday and she sang like that in an amateur way. I grew up listening to the radio at home : Billie Holiday, Billy Eckstine and stuff like that, real free R&B singers like Charles Brown, and pop, from Sinatra and the Modernaires. It was sort of a collage but I always tended more toward the gospel or R&B side as a youngster. When I came to New York and started high school, I hadn’t done anything professionally, but I always sang and always had something going on. Like fate or luck I came together with other guys ; we were in the same school and we all had similar musical interests. Charlie James [first tenor], who was my best friend as a youngster, grew up in Alabama. He came from very strong gospel roots but he also liked country, which was a little unusual at the time for an African-American person. Warren Corbin [bass vocals] lived in New York all his life, a very urbane young man. He used to like Nat Cole and people like that. Berman Patterson [second tenor] also grew up in Long Island, he was a more sophisticated ; he liked Sinatra. 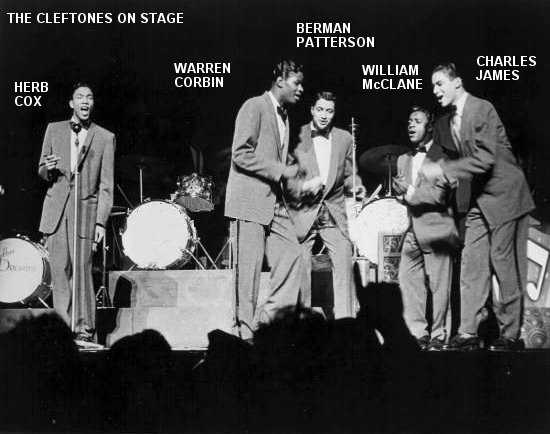 William McLain [baritone], the other member of the original five, was the guy who was really listening to the radio : early R&B groups like Jimmy Ricks and the Ravens, the Ray-O-Vacs, and then of course quick to follow them, people like the Flamingoes, the Five Keys, and the Moonglows. We were buddies. Photo at right : Herb Cox and Craig Morrison, April 2005, Green Bay, Wisconsin. There’s a real corny story about how we officially got started. We’d been singing a little bit but there was a general organization election at school. This is where the faculty try to encourage the student body to get involved in school elections. We thought this was decidedly square. We didn’t want to be bothered with it. However, one of the parties who was running for the student election wanted someone who could do a jingle for them, so they got us together. They [had] heard us on the handball court - at lunchtime we’d go out and sing and the girls would come around and we’d sing louder. It was 1955, we were 15, 16. There was another edict in the school—the school was a very conservative school, a good school, Jamaica High School—but they did not want any rock and roll in the school. This was a helluva thing to say in those days. To talk about a ban on rock and roll in the school was really not such an issue for the school because this is pre small portable radios. It’s not like kids walking around today—this is pre boom-box, it was nothing like that. It was trying to influence the kids I think not to listen to rock and roll on the radio at home and talk about it in school. At any rate this was the backdrop. So this one party that were perennial losers in the school asked us if we would come up with a jingle and take an official part. This sounded pretty good to us because it meant that we had time away from class to do this, so we got involved. We took a rhythm and blues song of the day called “Gee” by the Crows. It was really a rock and roll song. We thought we were being very clever : we changed the lyrics a little bit to fit this campaign. The party that we were supporting was called the Independent Party. (singing) “Oh oh oh oh gee, vote for IND, my my oh me, vote for IND. We’ve got what it takes to put you in the groove. If you vote for Independent we’ll really really move. My my oh gee.” We did this in the assembly in front of about 2,000 youngsters, fellow classmates. A teacher said “Isn’t that that rock and roll stuff ?” But on the other hand, we were participating in the election and they liked that, so they permitted it. The kids took it way outside of what we thought. They said “isn’t that cool ? they snuck rock and roll into the school.” At that time we were called the Silvertones, why I don’t know, but that’s what our name was. We later changed it to the Cleftones. That officially got us started because after that we started doing high school shows and things like that. Craig Morrison : The song that you sang at the assembly was “Gee” and your first record label was Gee. HC : That’s ironic, and that group, the Crows, along with a group called the Valentines, were on the old Gee label. They belonged to George Goldner. It was called Rama at the time. We never thought we would sign with Gee Records. Isn’t that funny ? Going to the Apollo Theater made such an impression on me. I remember Billy Ward and the Dominos there and I believe that the lineup at that time was Clyde McPhatter and Jackie Wilson. I thought whoever was singing was Billy Ward, but he was on the side playing the piano. When these guys walked out on the stage they had on powder blue sort-of-velvet jackets, white pants, and powder blue shoes, like slippers, with gold buckles on them. I said “whoa” and all the women said “whoa !” and I said “that’s what I want to do.” They were so self-assured. We always listened to the radio. The radio was the conduit for rock and roll. Specifically two disc jockeys in the New York area where we were growing up. One was of course Alan Freed and the other, that to us was equally impressive, was a man called Dr. Jive. His real name was Tommy Smalls. He was an African-American gentleman. His shows were at the Apollo Theatre. Alan Freed’s were at the fabled Brooklyn Paramount Theatre. We listened to both. Particularly after we had made records because we listened to see who dedicated records. We were still 17 or so, getting on 18 about that time. It was a fabulous situation to be kids and still try to go to school and have hit records. The Cadillacs were already well known, well established, and they had a reputation for being really snazzy dressers. We roomed with them : our dressing-room in the Fox Theatre in Detroit, Michigan was with them. We came in, we had our little outfit : a blackwatch plaid jacket, charcoal grey pants, white buck shoes, and a little black bowtie - what we’d wear to a school dance. We thought that was pretty snappy, and we all dressed alike. We put our stuff up on our rack. The Cadillacs came in and each of these guys had five suits : green, yellow, blue. We were really intimidated, and they were very polished on stage. They were a couple of years older than us and ahead of us. Light years ahead of us in terms of maturity. They grew up in Manhattan, we grew up in a relative suburban area of Jamaica. They were a more sophisticated group than we were, but they were great guys. We learned a lot, and even copied some stuff from them. They were good role models. Speedo and I are good friends today, and Bobby Phillips, who was one of the originals and still with the Cadillacs, we’re still friendly today. Every now and then we’ll talk about those old days, warmly. CM : They have been credited as the singing group that added the moves. HC : I think that’s true. At least from our era they were. The great dancer, Cholly Atkins, was their choreographer. [He went on to work, from 1964 into the 1980s, for Motown, choreographing the stage moves of many acts.] He had a very impressive vaudeville background. He danced with another gentleman named Honi Coles as the team of Coles and Atkins. They were vaudevillians and favorites. They had a comedy routine, they had a classic dance routine. They were both great dancers. I’d seen them many times at the Apollo. We knew that Cholly Atkins was in the business of giving choreography lessons as a sideline. If my memory serves me correctly, the Cadillacs were the first and we were his second students. Our record company set up lessons for us ; it was their idea. We were quite ready to do it because if we’ve got to compete with guys like this we’d better up our game a little bit. He choreographed about three or four of our songs, including “Can’t We Be Sweethearts” and “Little Girl of Mine,” but we still weren’t as smooth as the Cadillacs ! We were just less awkward. CM : Are you still doing some of the moves ? There was another group too, not quite as effective as the Cadillacs, called the Valentines who were on the label with us too. Richard Barrett [a member of the Valentines], who later found the Chantels and was co-writer of “Maybe,” was sort of a mentor for us too. He was a lot older than us. Had us straighten our hair, gave us the marcel hairdos [characterized by deep regular waves that are made by a heated curling iron]. You don’t have to be black to do this, but primarily African-Americans straighten their hair and they have waves in it. I had a big pompadour and I still wear a variation although my hair’s getting a lot thinner and greyer. There’s a substance that you put in the hair which is principally lye, and it can burn your scalp. When Richard Barrett actually did this for me first, he burned my scalp and I was afraid to tell my mother. Because I mentioned “I think I’m getting a marcel” and she said “don’t you do that to your hair, that’s stupid, what are you doing ?” But I did it, and he made a burn. I wore a cap home to hide it and when I got home the burn had created a sticky substance and I couldn’t get the cap off. I pulled it off and pulled off a big glob of my hair, so I looked ridiculous for about two months ! After we got into the business, Harvey Fuqua of the Moonglows unwittingly really influenced us. I was just talking to Harvey the other day. The Moonglows are my favorite group, hands down. I thought they were so creative and unique in their sound and I just loved them. We did a show in Hartford State Theater and Harvey set us down and said, “Let me show you guys how to do some different kind of harmonies, some minor harmonies.” It was just maybe 30-40 minutes but what he showed us, the subtleties that he showed us in that time, we used to build on the rest of our singing career. He opened a door. I love Harvey because he’s a gentleman but he’s an innovator : he’s written great songs, he’s a terrific singer, he’s introduced many other artists into the business like Marvin Gaye, the Spinners, and people like that. He’s worked with Smokey Robinson and many others. I personally always admired Harvey. But there were plenty others. Cab Calloway saw us at the Apollo Theater. He didn’t come to see us. He was at the Apollo Theater but we were performing and we came off the stage and he said, “Nice job, boys.” I think he just wanted to be nice to us and he said, “Can I tell you a few things ?” He said, “You guys need to brighten up your costumes a little bit. You can be classy but you’ve got to be a flashy. This is show business, show business.” That inspired us. He said “Did you ever see pictures of me ?” and we took him almost literally ‘cause he wore a lot of white suits and we went out and we got white suits. For a long time we were known as the group in the white suits. That was a trademark. We wore that for about 10 years, we always had one or two white suits in our wardrobe. Many years later we were out in Pennsylvania doing a show at a club called The Station and we were finishing up, we’d been there three days and the proprietor said, “Fellas, could you do one late show ?” We said, “No, we’re finished.” He said, “Cab Calloway’s in town with a Broadway-type revue and the whole cast is coming here after the show, so I want to have some entertainment. I’ll pay you guys extra.” So we said, “Cab Calloway, great.” We put up another show and he comes in looking like the star he is, with the big fedora, his camel-hair coat over his shoulders, and nice gorgeous looking people around him. 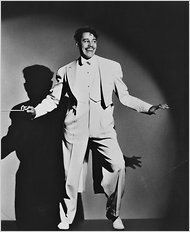 He’s being Cab Calloway. His road manager came over and said, “You guys are going to be on stage ? Okay, introduce Cab, but he’s not doing any singing, get that straight.” We said “Okay.” We went backstage and got ready for the show, put on our white suits : “This will impress him.” We get out there and start our show, we’re doing our thing, and about midway during the show, we said, “Ladies and gentlemen, the word ‘legend’ is thrown about all the time but we have here a true legend of the music and entertainment field, ladies and gentlemen, Mr. Cab Calloway.” He gets up and takes a bow. Everyone knew he was there and they’re applauding. In about 15 seconds people are saying “sing, Cab, sing, Cab, sing.” He gets up and says “Nah, nah.” “Sing, Cab, sing.” So he takes off his hat, drops his jacket off, and he comes up on the stage. We had thought we would do one of his songs, I forget which but it was well known. We only knew about two or three of his songs. We had told the band to play a little bit of that because we were going to sing it in honor of him. But he gets up on the stage and says, “You know my music ?” We said “We know a song.” He said, “No. Minnie the Moocher in F.” Just like that. And he counts it off and goes into “Minnie the Moocher.” And the place, the place – they forgot about us being on stage. We were trying to do some “hi di hi di ho’s,” some fill-ins, but we were clearly junior class to this guy. “Yeah, yeah.” He didn’t look happy. “I told you to spruce yourself up, but never wear the white suit when I’m on the show !” Because that was his trademark. He was serious. So there’s levels : the pecking order ! He wasn’t mean about it but he was a little annoyed that we had on the white suit. I don’t know if he thought we were mimicking him. We were certainly inspired by what he said. CM : Did you take anything musically from that swing era ? HC : I think we did, maybe subconsciously. We still like that kind of thing, the Lindy swing. I don’t think we ever seriously incorporated it in our recordings. It’s more evident and visible in some of our on-stage things that we do. I always thought of rock and roll as a sea and all these rivers fed into it from gospel and jazz and swing, all of it. It’s really and truly America’s music, as much as jazz is, because it came from the various communities and sections of the country and there was a commonality. We worked with Buddy Holly and the Crickets and while we thought they had a great sound, they thought we had a great sound. “How did you guys do that ?” “Well how did you guys do that ?” It was really neat to find out that even though they were from Texas and we were from Long Island, there was still this commonality basically around our ages and trying to do music. A very similar background as we had, just in a different place. I think there’s no doubt about it that rock and roll was the crossing of the cultural barriers. The radio stations were at the very center of that, but other things were at the center too. A lot of it had to do with desegregation of the schools. There’s so many things that you could mention. I think there was a different attitude, especially in the African-American community. Now I don’t know this because I was a kid then but I think with the end of World War II, which coincides with what was happening at the radio stations, there were a lot of African-American men who were becoming more expressive. They thought they paid their dues, been in the war, fought for their country, and there was a more overt expression of African-American culture. 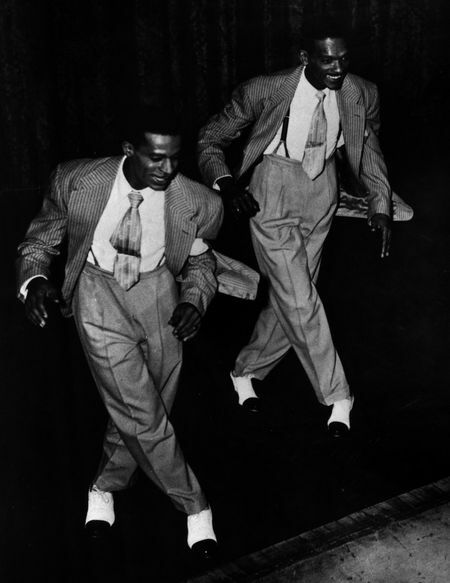 African-Americans have always had a flair for a way of dressing and the music goes back to the pre-Cab Calloway days. What always happens in this country is there’s always some rising class that’s coming up. Certainly the Jewish people in our country went through this and suddenly most of the best boxers and athletes were Jewish for a time in the ‘20s. Benny Leonard and people like that. Then the Italian-Americans who came over—suddenly there was Joe DiMaggio and Frank Sinatra and Perry Como and Vic Damone. I think that surge to get ahead comes out of breaking, where you see the opening where we can get to the middle-class, we can join the rest of the folks. I think that’s what African-Americans saw. There were a lot of people who went into music with a different attitude and more pride in their culture and all of this stuff that maybe wasn’t there before. There’s so many elements that went into the beginning. It’s a lot of things. People say “why is this music so meaningful today ?” It has to do with the heyday of this music coinciding with all the social revolutions in this country : the civil rights movement, the feminist movement, the youth movement. Remember now in this country you could go to war and get drafted at 18 and you couldn’t vote until you were 21 so there was the whole thing, Rebel Without a Cause, Blackboard Jungle. I think all those movements were fuelled by rock and roll and I think that’s why it’s lasting, because there were so many significant things that happened to the people who lived through that era. I told you our first three recordings were hits. They were written by us. I wrote “Little Girl of Mine.” One of the other guys wrote “You Baby You.” And then I wrote “Can’t We Be Sweethearts.” So we thought, this is easy, we’ll write songs and make hit records. But after that the sales started dropping off and for about three or four years we continued to do that without much success. One of the arrangers at the record company said, “You know, guys, there’s one thing. Some days you may go in the studio and you don’t sound good or the band is lousy or something. So all those things can happen and they’re excusable, but there’s no excuse to do bad songs. ‘Cause there’s so many great ones already written. Why don’t you take a great old song and adapt your own style to it.” We had also been listening to Sam Cooke do things with some of the old songs. We recorded “I Love You for Sentimental Reasons” and had a hit with that too, but we took the most standard of all those songs : “Heart and Soul.” I remember as the piano lesson : ding, ding, ding……..ding ding ding. One of the guys, Charlie James, was playing a guitar and that was influencing the way that we were singing. We hadn’t played it in conjunction with any of the music before. He and I were both lovers of Sam Cooke and we used to sit down together and work on ideas and that’s how it developed, out of that. I’ve been doing this for 50 years. I’ve had other jobs and I’ve done other things but I’ve always been involved with the Cleftones and always been a singer. We’ve always worked—not a lot sometimes—there were plenty of lean years ‘cause that’s why I had a job, to pay the bills. It’s about respect, because nobody wants to do something for 50 years and think that it wasn’t important or that it was trivial. Now I know we didn’t get properly paid and compensated for what we did. I know there were people who were against this music and who wrote tons and tons of articles in the press and they said “ah, there’s no stars in this business…It’s not creative…This music will die in two years.” They were wrong. We’re still doing it and the music still has a great life. So to me that’s some vindication : that we have the longevity of 50 years. But I would like for people to really recognize what it costs to do this : it costs everything. I know people, singers whose names you would know, who lost their families, who lived in poverty, who suffered through all types of indignities. All of this just for the sake of trying to promote the music because they believed in it. So I would like to be remembered as a guy who believed in it and who stayed the course and who did something that was significant in his time in terms of music. I have also posted several additional interviews with veteran musicians. To go to the index page, click here.